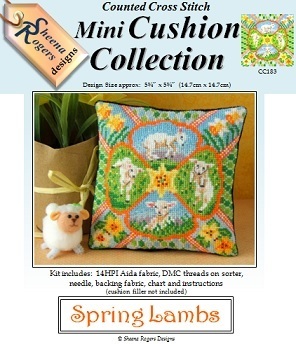 These Spring Lambs are full of the joys of sweet sunny mornings surounded by lush green grass and sprigs of Spring flowers. Three lambs are jumping and leaping while the fourth is taking a rest, nestled in the grass. There are Spring blooms of dazzling Daffodils and pretty Primroses in the corners of the design too. Only whole cross stitches are required (so no fractionals), with a little backstitch needed for the detail on the lambs.